For the Jackets men’s and women’s tennis teams, the peak of ACC competition season is still months away. While the fall provides the group an opportunity to gauge itself against the rest of the NCAA, championships are won and lost in the spring. In the meantime, though, another group of competitors is slicing and volleying its way to wins against foes across the South and beyond. The Tech club tennis team ignited its season two weekends ago with a fifth-place finish in the United States Tennis Association’s Tennis on Campus (TOC) 2016 Fall Invitational. The tournament, originally scheduled to take place in early October, was pushed back to the month’s last weekend thanks to Hurricane Matthew. While Matthew did not ravage Hilton Head, the home to TOC 2016, it posed enough of a threat that tournament officials postponed the event. Nevertheless, the Jackets were ready to compete from day one, and it showed in the results. Tech jumped out to a 3-0 record on the first day of competition, defeating a trio of teams in pool play. In the next round, they edged the University of Florida’s ‘B’ team. Thanks to the tournament’s delay keeping a team from attending, Florida was the only school at the event allowed to bring a second squad. The Gators were competitive but lost to the Jackets by a narrow 23-22 margin. Tech then faced UF’s ‘A’ team, with less success. This time, it was the Gators who exited the courts victorious with a 26-18 win that left some members of the team feeling that they had missed an opportunity to prove their ability. Nevertheless, Tech moved into the fifth-place bracket and won contests against a pair of Midwestern powers, the University of Pittsburgh and the Ohio State University, to clinch their spot. The tournament, while not an unqualified success for the Jackets as a first place finish might have been, nonetheless offered positives to carry home. The first was the team’s ability to quickly adapt to a new style of play that came with the venue. The Palmetto Dunes Tennis Center is notable for its clay courts. The surface requires players to adjust their reactions and shots to accommodate for different bounce speeds. Luckily for the Jackets, though, their team’s experience and collective talent made the adjustment smooth. “A lot of the players on the team have played junior [tournaments], so they played on clay and hard courts when they were in high school,” said first-year Kelly Zou. Within the team, there is real optimism for the second semester, which brings about regionals and nationals, club tennis’ championship season. 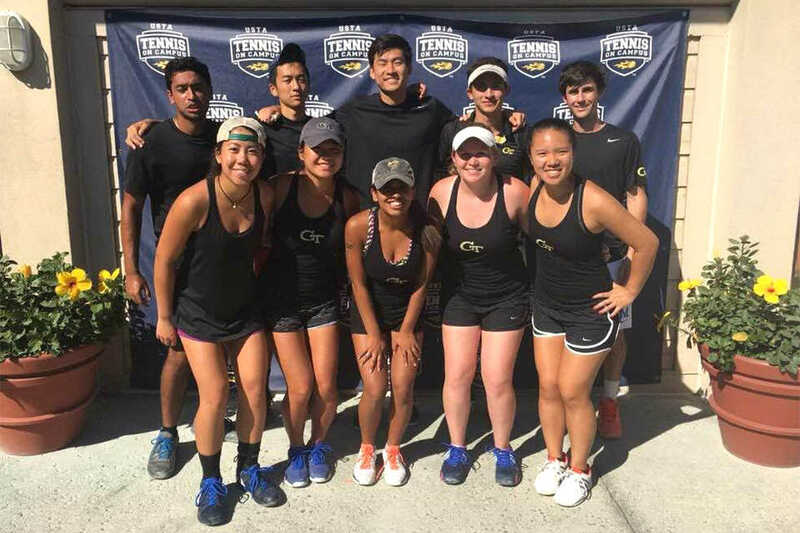 “We actually have been to nationals all 4 years,” said fourth-year Marissa D’Souza, who has competed for the club tennis team each year at Tech. “We’ll keep practicing hard and hopefully we can go on to nationals,” she concluded. Despite her relative inexperience in the world of college club tennis, Zou feels the same way. “I feel like [Florida was] beatable,” she laments of the team’s lackluster elimination round performance against the Gators. While there is plenty of room tom improve, there is no reason Tech club tennis cannot return to nationals this season.